Since we have been ridding our home of grains one of the foods we have all mourned the loss of is pizza. It was a super simple relatively healthy (especially if homemade) dinner that we all enjoyed and all kids would eat with gusto. Besides, what American family doesn’t enjoy pizza? The more we missed it the more I was on a rampage to find a substitution. And a few we have found! The following two recipes are not mine at all and I don’t even attempt to claim them! One is made with cauliflower and the other eggplant. I never would have told you it could be done if I hadn’t done it myself. These recipes do take some time, but they are simple and easy to follow and it’s well worth the effort. If you have a [amazon_link id=”B00004S9EM” target=”_blank” container=”” container_class=”” ]cuisenart[/amazon_link] it makes quick work of the process. Most of the time is in waiting on the crust to cook before it can be topped and rewarmed. These crusts do well as left overs as well! I reheat it in the toaster oven (since we have no microwave) and they are crispy, warm and delicious! I will say these crusts are more comparable to a thin crispy traditional crust… no where near the same as deep dish… so if that is what you are going for, read no further… pass and move on! Sorry to disappoint! Another things I’ve done is purchase a few cauliflower or eggplants and process them and freeze in the amounts needed for a crust. Which makes it super easy to mix up in the future. You will need to squeeze out the extra water before mixing it up, but it’s a minor extra step! A few weeks ago I made both of these for dinner with friends who can be foodies and definitely enjoy good food. They eat pretty healthy, but not paleo or gluten free or dairy free or any of those. With that said I was a little nervous making a paleo meal we thought was good. It was a hit! I was relieved and it gave a boost to my belief that these really are good recipes! Here they both are! Give it a try! This recipe is from Deliciously Organic. Check out Carrie’s blog for some other great recipes! Preheat oven to 450ºF and adjust rack to middle position. Line two large baking sheets with parchment paper. Place all crust ingredients in a food processor or blender and process until pureed. Spoon mixture onto baking sheet lined with parchment paper, dividing into 4 servings. Using a spatula , spread each serving of cauliflower mixture into a 10″ round (about 1/4″ thick). Remove from the oven and spread 2 heaping tablespoons of marinara on the crust. 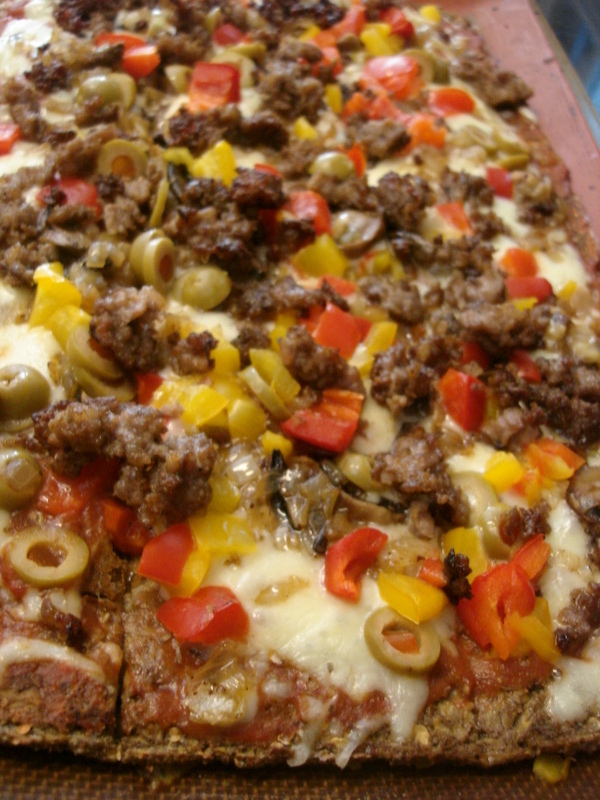 Top with Fontina and any additional toppings. Bake for an additional 5 minutes until cheese is bubbly and just turning golden brown. This recipe was from The Food Lovers Primal Palate. Check out Hayley and Bill’s blog for other great recipes. Pour grated eggplant into a large mixing bowl. Add in flax meal and almond meal. Whisk egg in a smaller bowl and add to batter. On a parchment lined baking sheet, pour batter. Smooth batter out with hands into a thin layer (around 1/8″). Bake for 30-35 minutes, or until cooked enough to flip. Remove from oven. Lightly grease another piece of parchment paper, and place on top of crust, carefully flip the crust and then slowly peel off the parchment paper from the bottom side. Brush the flipped side with olive oil. Bake opposite side for about 15 minutes, and remove from oven to apply toppings. Baby girl can’t have dairy so I made her pizza with no cheese and it was still quite good! Try it sometime… not completely necesary to enjoy pizza although I will say I prefer it with! Also baby girl can’t have egg whites, so I made a smaller crust for her that had just egg yolks. This crust can be made with no eggs and just increase the flax meal by a little bit. We eat pizza a lot of different ways, but here are some of our favorite toppings! Ham – I often use left over from another dinner, chop it up and throw it on top! Goat cheese – really good with green olives! How do you make your pizza? Have you tried one of these crusts before? Let me know what you think! I’ve made the eggplant crust and a variation of the cauliflower crust. The eggplant crust was my favorite, but the cauliflower crust was more of an overall hit with the entire family.